Some sensible thoughts on the thought of secession. In the aftermath of the reelection of President Obama there has been a lot of talk of secession Most of it more hilarious than serious. However, in reaction to some of the more outlandish things that have been said, please allow me to lay out a hitchhikers guide to secession in the United States. So the beginning is not the Constitution, but the Declaration. So what does the declaration say about the founders views on secession? Well if the Declaration outlines American Values then we can say that at its heart, the right to secede is an American Value. As you can simply read from the Declaration, the Founders cite Natural Rights as the basis of their rational for being able to leave the British Empire. As a matter of fact the founders say that it is "their duty" to "throw off such Government..."
I believe that if you told the founders that the price for joining the Union would be that no state could ever leave the Union, that the was the price of admission so to speak, the Union would never have been formed. They saw the Union as a consensual act among free people. Well, Lincoln changed everything with the Civil War. While I and the founders may cite natural law and natural rights as the basis for the right of free peoples to come together as they choose and sever there bonds as they choose, Lincoln taught us that there is something with a little more persuasive force than natural law and rights: the right of conquest. Basically, the Union is forever, "indivisible," and that the Federal Government will use whatever force is necessary to preserve that. In a parallel universe, had you shown the Founders what Lincoln would do to preserve the Union nearly 100 years after the Constitution was approved, I can state with 100% faith that they would never have voted to form the Union in the first place. So was Lincoln wrong? No, I can't say that. He won. It was for the betterment of mankind. The basic conundrum of the United States is this: E Pluribus Unum. In the years after Lincoln's victory the United States has done a delicate balancing act of how much the republic wants to be "many" and how much it wants to be "one." Basically, how strong the central government should be. Examples abound today. Roe vs Wade made the United States much more of a "one" place. The legalization of marijuana and gay marriage are making the several states much more of a "many" place. Today we have some people who believe in Federalizing everything. In a recent Men's Health there was an article about putting seat belts on school buses. A noble cause I am sure. The author of the article urged the readers not to contact their local school boards, or even their state legislatures, but instead he urged that they should contact their congressional representatives in Washington D.C. Taken to its natural conclusion, why even have independently elected Governors or Legislatures, the states should simply be administrative districts for the federal government. I think most Americans oppose such an idea, they like the weirdness of Vermont, the "Texasness" of Texas and the "nice" of Minnesota. So we come back to the present. What is a rational way to have a discussion about secession? Firstly we have to admit that one day, either ten years from now or a thousand years from now, a state will eventually leave the union. That day will come, how we react to it will be what matters. If you would have told the average American ten years ago that we were going to have gay marriage, a black president and legal marijuana in a decade, they would have told you that you were nuts. Change happens, sometimes faster than you can anticipate. There are many examples of the wrong ways and the right ways to deal with different groups of people who don't want to live together. A sure fire way to a civil war is to make people live together when they despise each other. The United States can look to the break up of Yugoslavia as a lesson in how not to handle secession. There would be no modern Lincoln. Instead you could imagine an American President standing trial for crimes against humanity in Europe for his actions trying to hold the Union together. Instead of coming apart like Yugoslavia the United States should look towards peaceful separations, such as the dissolution of Czechoslovakia. There should be a high bar for a State leaving the Union, I suggest a 2/3rds vote of the people in a plebiscite, maybe 3/5ths on the low end, but a super-majority would be a precondition. We can all look to the founders for guidance on this, the Declaration is a road map for how a proper secession should go. The super-majority requirement would make the requirement that "Prudence, indeed, will dictate that Governments long established should not be changed for light and transient causes;." Which follows with natural law and natural rights. In the end we have to ask ourselves this question as Americans, if for example the people of Texas vote 90% in favor of leaving the Union, is it right to force them to stay in? What sort of nation would that make us? The bar must be set high, but eventually a state will leave the Union, it would serve us well to prepare for it before it happens. The Colorado State House is truly a toss up. Each party has 26 safe seats. It takes 33 seats for a majority in the lower chamber. Over the last few election cycles the Colorado GOP has been clobbered by the Democratic Party in the state house elections. The GOP believes that it can now match the Democratic Party in these races. These are new districts so a lot remains to be seen. Currently the GOP has control of the State House 33-32. Colorado State Senate Projection 2012. The GOP needs to pick up three seats to gain control of the chamber. It just so happens there are three competitive districts this cycle, all are being defended by Democrats. The last few election cycles the GOP has under performed against Democrats down ticket. Watch the returns on District 14, 19 and 35 to see if independents are not breaking for Democrats like they normally do in down ticket races here. It is very unlikely that the GOP can swing all three seats. SD 14 Democrats have a 3% registration advantage. SD 19 Republicans have a 1% registration advantage. SD 35 Democrats have a 2% registration advantage. Final 2012 Residential, Senate and House Projections. Final 2012 Presidential, Senate and House projections. President: This race really is too close to call and well within the margin of error. Obama is clearly the favorite at 2:1 to win this race. It would be lame not to nail down specific numbers for our toss up states. So here is our final projection with no toss ups. Obama starts with a solid base of 253 EVs. Romney has a base of 206. Needless to say there are fewer losses that Romney can afford if he wants to reach 270 EVs. Here is how Mile High Delphi rates the toss up states, smallest to largest and our final EV projection. New Hampshire, 4 EV. The demographic make up of this state favors Obama. It will be close but a Democratic win. The GOP can scratch the loss of the North East to social conservatism. Iowa, 6 EV. If we had a rational electoral system this state would have about as much to do with the election as Alaska or Hawaii, but we don't. It will be super close here, Obama under performed the polls here in 2008 with a win margin below what the polls predicted, by nearly 5.5 percent (this is a methodology problem, which is the problem with using polls as a predictor). We score this a very narrow Romney victory. Colorado, 9 EV. Obama had a blowout win in Colorado in 2008. The polling done here is hopelessly flawed. The actual data so far, which is absentee ballots sent in in 2012 vs 2008 shows that Romney should have a comfortable win of a few percentage points. Obama's base just is not there. Virginia, 13 EV. This state will vote for Romney, long term the GOP will have problems here because of the DC suburbs, but the one time wonders who pushed Obama over the top in 2008 will not turn out and vote for awhile. Ohio, 18 EV. You might as well toss a coin on this one. We have to make a call, once again we believe that the one time wonders who turned out for Obama in 2008 will just not be able to figure out how to vote this time around. We score it Romney. Florida, 29 EV. Florida? Really you have this as a Toss Up? Well our model says it its close so yes. We think Florida will be within a point or two, just like Ohio but that Romney will grind out a win based upon the one time wonder voters again not turning out for Obama. Senate: The GOP circular firing squad continues to spoil the chances of this party winning the upper house. We think that the two parties will trade a few seats (with an independent hoping in too) but that overall the Senate will look the same next year as this year. 47-53 Democratic majority. The only surprise could be Wisconsin. House: We will save everyone the pain of looking at individual races. Look for the House to have about 240 Republicans vs 195 Democrats. You can give or take a few but the GOP has a 100% probability of controlling the lower chamber in the next session. 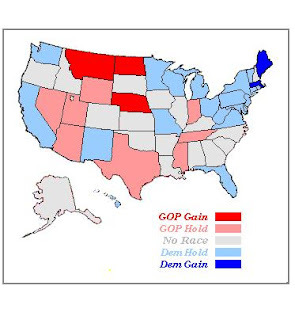 US House Projection 2012 GOP Control 235-240 seats. We put the probability of GOP control of the US House at 100%. The GOP will probably lose a seat or two. We stand with a prediction of 235-240 seats. Democrats Pickup Maine and Mass. Republicans pick up Montana, North Dakota and Nebraska. I have this race listed as 3:2 in favor of Obama, pretty close to a tossup. The new geography of Colorado. The votes are still being tallied. But we can say one thing about Colorado, it is not a midwestern state. Colorado seems to have changed dramatically over the last decade. It holds little in common with its neighboring states, and it seem to take its political leanings from the West Coast, California and Washington seem like the easiest comparisons. In fact, to paraphrase Scoop Jackson, every vote you need to win in Colorado you can see from the top of Lookout Mountain. 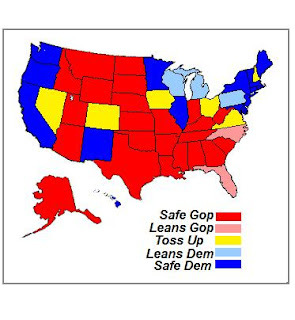 2010 Final US Senate Projection. We project a GOP pickup of eight seats in the US Senate. Here are the seats listed in order of how likely the pickup is. Washington projects a Democratic win at about 55% probability. Should be close. California should not be very close. Mile High Delphi looks at Obamacare. We here at Mile High Delphi have four words to say about the Health Care Reform package that is going through congress; Much Ado About Nothing. Obamacare, as it has become known, is probably unconstitutional, at least several key parts. We cannot find constitutional grounds for the Federal Government forcing private individuals to purchase private insurance. They could just impose a tax, or the states could impose the mandate. Also the accounting gimmicks in the bill make Lehman Brothers look like the bank from It’s a Wonderful Life. In all, the courts will hold up most of the bill from taking effect, at least until after the mid-terms and congress will never have the BALLS to enact the cuts and tax increases that the bill counts on. Our final verdict on the bill, it has been a fool’s errand for the Democratic Party. This whole saga reminds us of the story of Xerxes at the Hellespont. The great Persian king had built a bridge across the river in order to move his troops. A storm washed the bridge out. Xerxes flew into a rage and “he commanded that the Hellespont be struck with three hundred strokes of the whip.” Seriously, he had the river whipped because it wouldn’t bend to his will. It is too early to know if this is an overreach, but this health care bill is starting to look to us like the court packing scheme that FDR hatched in 1937. National projection updates will be coming this week. As for Colorado, look for the 3rd CD to move into the toss up category, the 7th to become more competitive and Betsy Markey, the Freshman Democrat Representing Colorado’s 4th CD, put a fork in her, she’s done, the GOP could put anyone up and beat her at this point. The Democrats currently enjoy a 21-14 majority in the Colorado State Senate. In our last post we looked at some competitive races. Our original forecast hasn't changed. District 6 currently is our only race ranked as a toss up. Senator Schwartz seems well on her way to buying her reelection in SD 5. SD 16 should be competitive on paper. Joan Fitz Gerald won this district a decade ago, she turned it over to Dan Gibbs and he won the district in his own right in 2008. The independents break for the Democrats in this mountain district. Voter sentiment seems to be trending against the Democratic party this cycle, so a close look at candidate financing reports will give us an idea if this seat really is in play. SD 2 looks likely to remain in Republican hands. SD 11 has simply become too Democratic for the GOP to hope to pick it up. Macro events could push it into the toss up category however. Lastly, SD 20. The Republicans would love to win this district, but Jefferson County, especially in the old ring suburbs has trended Democratic over the last decade. Look for the Democrats to outspend the GOP by 3-1 or 4-1. The real fight will probably be the Democratic primary.